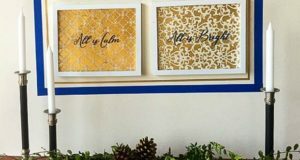 With it’s easy refinement, French-inspired designs continue to be a go-to style for designers, DIYers and homeownersalike and adding a little stenciled French flair to your home has never been easier! The sophisticated style lends itself to more eclectic and artistic interiors with surfaces ranging from walls to fabrics to furniture and decor accents. Let’s take a look at how some of our very creative Royal Design Studio customers created ultra chic surfaces with French flair! 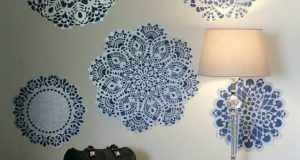 Tradition meets the 21st century is this stenciled contemporary master bedroom by Jamie of So Much Better with Age. 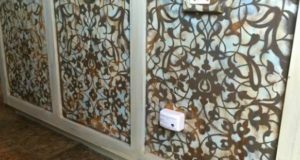 She was going for an allover wallpaper look without the headache, and the French Bee Trellis Stencil pattern charmed both her and her husband. The bee motif is considered as the oldest emblem of the sovereigns of France and this regal design has easily found its way into modern interiors. It’s the perfect pattern choice for this stately, elegant bedroom! Our friend Michelle from Hello Lovely is always dreaming up ethereally chic projects. She most recently created a dreamy stenciled dressing room with our Fortuny Stencil, but she also used the French poetry of our Springtime in Paris Letter Stencil to add pattern to a surprising surface: a mirror! What could have been a traditional, soon-forgotten home accent now is a beautiful focal point that also visually expands the space. What a fun, flirty piece! 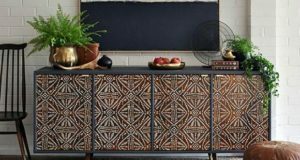 We are in amour the fresh color palette of this stenciled credenza, too. Customer Joan Chamberlain chose the French Floral Damask Stencil from the Allover Damask Stencils Collection to add energy and verve to a basic stained furniture set. Damask patterns were a favorite of French nobility who used them to adorn their walls, windows and furnishings. To these stenciling ideas, we say ooh la la! Do you now have fabulously French stencil-bilities on the mind? Everything about France oozes ultracool flair, especially their architecture and decor. Royal Design Studio makes it easy to incorporate this stylish look with your favorite patterns and color schemes. And oh – we’d love to see your results!